Andy Buckley er fyrrverandi sérfræðingur hjá Farlows í Bretlandi. Hann hefur varið allri ævi sinni sem veiðimaður og veitt allar gerðir fiska um heim allann, hvort sem um er að ræða ferskvatnsfiska, eða hitabeltisfiska. Oft er leitað til hans í bresku veiðipressunni og hann hefur komið fram í Fishing Britain sjónvarpsþáttunum. Hér skoðar hann og prófar River & Streem fluguhjólið frá Wychwood – greinin er á ensku. „Technological advances in carbon-fibre fishing rod manufacturing are driving the weight of modern rods further and further down. A quick glance through the new 2013 Sportfish catalogue will reveal rod weights as low as 1.4 ounces! Such rods are a joy to cast and fish with, and can make every fish seem like a monster, but there has been an issue with this, one which I have experienced personally. My go-to dry fly rod is my Sage TXL-F 7’10” 4# (it’s my pride and joy! ), which weighs in at a crazy 1.9 ounces. Finding an affordable but quality machined aluminium large arbour reel which is light enough to not spoil the balance of the rod has been a real struggle. Fortunately Wychwood Game brand manager and fly tackle design guru Paul Richardson appears to have solved the problem for all light rod enthusiasts with the stunning new River & Stream reels. At the time of publishing the Wychwood catalogue they are the lightest machined aluminium reels on the market, with the 2/3 size version weighing just 50 grams! Aesthetically the reels are a little different to many others available, the main difference being a very short centre spindle which has been re-designed to drastically reduce weight. The curvaceous ported spool is a custom design which will not only reduce weight but also increase structural strength. The subtle matte golden leaf anodising suggests understated class, rather than many other manufacturers gold reels which can appear more like something hanging around Eric Bristow’s wrist. The adjusta-clicker drag system provides enough torque to prevent over-running whilst stripping line from the reel without adding any unnecessary weight. 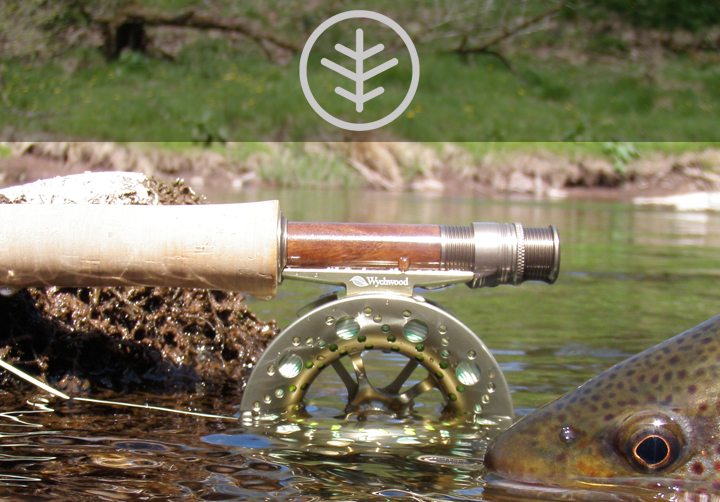 My worry with any lightweight item of tackle always concerns durability, and with this in mind I chose to take the reel for a weeks fishing and camping around the stunning upper Usk in South Wales. Anybody who has fished the top stretches of the Usk will be aware of the treacherous wading conditions and I knew that over the course of a week the chances of me taking a tumble on the slippery bedrock riverbed were quite high! Sure enough the reel did get bumped, knocked, dropped and fish took line from it. At the end of the week there was not so much as a scratch to be seen, a true testament to the quality of the aluminium and anodisation of these fantastic reels. Most importantly the balance of the rod wasn’t at all compromised by the super light weight River & Stream 4/5#, these reels are fantastic value, not only for anglers who own high end rods but also for those who have bought mid-priced river rods like the Greys Streamflex or the Guideline Fario.